The fourth in the Learning Brief series, our latest research aims to help those working in agricultural finance better understand how to influence decision makers. 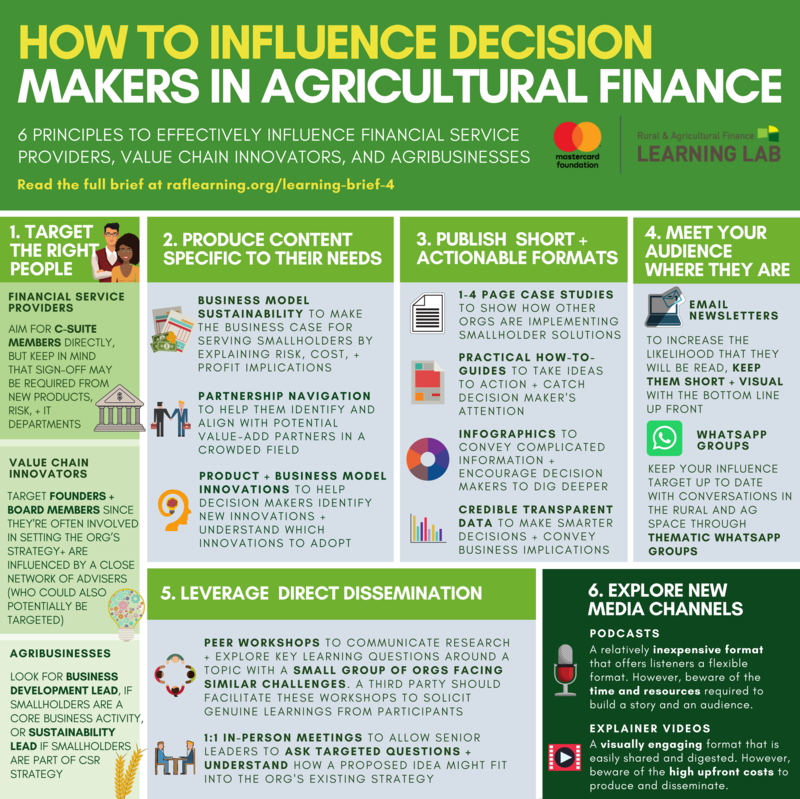 This short brief and related infographic provide six core principles to effectively influence key stakeholders in agricultural finance. Our 2016 state of the sector report estimates that formal financial institutions and value chain actors only meet one sixth of the USD 200 billion smallholder finance need. To address the gap, stakeholders in the rural and agricultural finance sector need to make bold strategic shifts, such as vastly expanding customer-centric financial services to smallholder farmers, pursuing progressive partnerships, and maintaining a sharp focus on smallholder farmers when scaling innovative models and technologies. The Lab, in partnership with Dalberg Advisors, identified three stakeholder groups – including (1) financial service providers, (2) agribusinesses, and (3) value chain innovators – whose strategic shifts would be particularly influential in addressing this gap. This brief and accompanying infographic outlines the six core principles that can help influence decision makers in each of these stakeholder groups in order to help close the smallholder financing gap and bring millions out of poverty.